Last night we saw a Wigan Athletic team keen to put Saturday’s reverse against Bradford behind them. They went at Doncaster from the get-go and were rewarded with a flattering scoreline in their favour. There were several people on the pitch last night seemingly wanting to stand out. Among them were Ryan Colclough and referee Carl Boyeson. 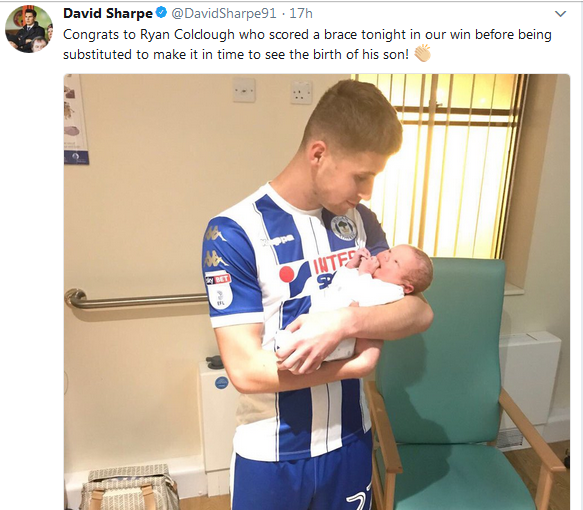 Colclough’s two goals and his rapid departure to the hospital after 60 minutes of the game will be a tale told by Latics fans over future generations. It was such a good story it even made giant American newspapers, USA Today and the Washington Post. From where I was sitting in the Boston Stand it was hard to figure out why the player had left the field of play so early. Indeed some fans were clearly irritated to see him being pulled out of the action when he had just scored his second goal and was up for a hat trick. But it turned out to be a happy ending for both player and club. Paul Cook had made four changes, bringing in Colclough, Lee Evans, Reece James and Will Grigg. In the absence of Nick Powell, Max Power started in the number 10 position, but as the match progressed the lines became blurred regarding the positions of players in advanced midfield. Just before the referee blew his whistle to start the game a spectator sitting close to us offered his view on why Latics had lost to Bradford. His view was that, like other teams Wigan have recently faced, Bradford had figured out the way Latics play and had learned how to deal with it. There may be some credence in that, but I put Saturday’s defeat down to a “soft” goal in the 92nd minute. Wigan’s plan to compensate for the absence of orchestrator Powell seemed to be working to some degree as they showed urgency and threatened the Doncaster goal. But they looked edgy and gaps were opening up in the home defence that we were not seeing earlier in the season. In the event Latics had Doncaster centre forward john Marquis to thank for missing a sitter with the home defence all at sea. Wigan were to go into the dressing room at half time ahead thanks to a crisp strike from Michael Jacobs which took a deflection on its way home, with another deflection helping Colclough to notch a second. Perhaps the most noticeable figure on the pitch in that first half was referee Boyeson. From the start he had drawn our attention through an over-officious approach, allied with some poorly judged decisions. At the beginning of the second half both teams had been lined up for the kickoff for several minutes before the refereeing team made its entrance on the pitch, accompanied by jeers from the crowd. Boyeson continued to annoy the paying spectators for the remainder of the match. A brave header by Colclough made it three, the win putting Latics within one point of leaders Shrewsbury who lost 1-0 at bottom club Bury. Will Cook’s centre forwards ever score many goals? Will Grigg looked a forlorn figure last night, his body language hardly suggesting he was going to score. So often he was having to deal with high balls launched in his general direction, with corpulent opposition defenders seemingly being given carte blanche to use their arms to keep him shackled. Despite Grigg’s frequent appeals the referee continued to allow it to continue. But, opposition fouling withstanding, is Grigg the kind of centre forward to thrive on Cook’s style of play? Cook employs the flanks to great effect, full backs and wingers being expected to combine and produce crosses into the box. It happened again last night, some crosses being wayward, others posing danger to the opposition goal. But Grigg was mostly a lonely figure trying to latch on to them. Heading is not the player’s strength anyhow. Grigg feeds on incisive low passes, his movement making him a real threat to opposing defences. He got few of those last night. Ivan Toney might not so often make the intelligent movements of Grigg, but he can certainly head the ball. But he too has looked out of touch, shackled by rugged central defenders. One of the main criticisms of Toney is that he goes to ground too easily. There is an element of truth there but so often, like Grigg, he has been outwrestled by big centre halves. Not only Boyeson, but League 1 referees in general, permit excessive use of the arms by defenders. Both Toney and Grigg have been on a hiding to nothing, making them look worse players than they are. Up to this point Grigg and Toney have scored 7 goals between them in 18 league matches. The chance of either reaching the 20 mark by the end of the season seems remote at this stage. James came back last night in his first league appearance since late September. He once again showed what a good player he is. James has been kept out of the team by the fine form of Callum Elder, on loan from Leicester City. With the diminutive Nathan Byrne at right back, the 6 ft tall Elder has added height to the defence as well as being an excellent attacking full back at League 1 level. However, of the two James is arguably stronger defensively and his crossing is at least as good as Elder’s, if not better. Cook will count himself fortunate to have such talent at hand for the left back position. James was recruited from Manchester United by Gary Caldwell in the summer of 2015, on a three year contract. Like Elder he has had his ups and downs with injuries. But assuming that James is now fully recovered from a long term foot injury, Latics would do well to tie him into a new contract. Can Colclough become a regular starter? Ryan Colclough had his first league start yesterday under Paul Cook. The 22 year old only made two starts for Latics last season. He made 7 starts in the 2015-16 season after being signed by Gary Caldwell in January 2016. In fact Colclough has a career record of 58 starts and 49 appearances off the bench for Wigan, MK Dons and Crewe Alexandra. Will he ever become a regular starter under Cook? Colclough’s goals came at the time of the arrival of his second child, not an easy time to focus upon claiming a regular place in the team. But he is a talented player, having already scored 5 goals in all competitions, despite limited game time. Can Cook get the best out of him? Is there room for Evans, Morsy and Power? Lee Evans was excellent last night, strong in defence and distribution. He has been a key player in a successful season so far. Evans was signed on loan from Wolves in summer when it looked like Max Power was leaving. The Welshman’s suspension for a red card at Scunthorpe gave Power the chance to get back into the starting lineup, which he did successfully. With Sam Morsy seemingly being an automatic choice, Cook made the decision to include all three last night. Should Powell be fit to play on Saturday, Cook will face a difficult decision to make. Jack Byrne to be back? Byrne is a gifted footballer, naturally suited to that number 10 role behind the centre forward. The 21 year old was signed by Warren Joyce from Manchester City in January 2017 on a three year contract. However, Byrne received scant favour from the manager, making just two substitute appearances over four months. Rumours suggested that there were issues with both temperament and fitness. Byrne was to receive no favours from Cook either, the new manager sending to train with the youth team before dispatching him off to Oldham Athletic on loan until January. However, the 21 year old Dubliner has enjoyed a highly successful loan stint at Boundary Park up to this point. He has been an inspiration behind a team that was struggling in the relegation zone, but has now climbed up to 16th place. Byrne has made 17 starts, scoring 5 goals with 3 assists. In terms of fitness, Byrne has completed the full 90-minutes-plus in the majority of games he has played and when he has been substituted it has typically been in the closing minutes. Cook has already hinted that there will be some additions to the Latics squad in January. Assuming Byrne continues to impress at Oldham a recall looks probable. Byrne is certainly a young talent, potentially capable of not only impressing in League 1, but in higher divisions. Decent article with some well made points. Crossing is not Reece James’s strong point … it has improved but Elder’s crosses up until the Bradford match were far superior. Not sure what happened to Elder during the Bradford match …..
Reece James also has had a distinct reluctance to take on players in 1v1 situations. He tends to pass sideways or backwards with another player in the near vicinity. Last night, he did look a different player (at times) mind you. Thanks for your comment, Question. For me, both are class players at League 1 level. Both have the ability to put in quality crosses. So I have to disagree with you about James’ crossing abilities. Under Caldwell he was reluctant to cross – presumably under orders. The problem at the moment is even if James or Elder does put in a good one, who is going to put it home? Moreover Cook has the choice of offering James a new contract or negotiating with Leicester for Elder’s release. Such things are in the hands of the owners. For me, i would keep both if Latics were to be promoted. Thank you so much for your kind words, CM. I know Mexico, having lived in Mexico City and watched so much Mexican football. My son Ned liked America, me Cruz Azul, who played in Latics’ blue and white. Despite western media negativity it remains one of my favourite places to live. What a fascinating country and culture! I hope you have subscribed to iFollow so you can watch all the latics Games.